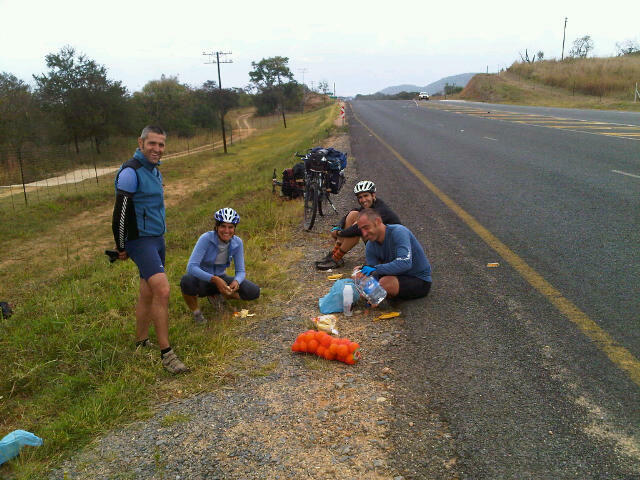 A chance meeting on the road between Nelspruit and Barberton the other day - a group of 4 friends from the Basque region of Spain, on day 1 of their two month long cycling holiday through SA, Swaziland, Mozambique and Zimbabwe. They were slowly making their way to Piggs Peak in Swaziland and I stopped for a chat and to feed them some oranges, bananas and to top up their water bottles. Aitor, Koldo, Ane and Anartz are all teachers, speak basic English and are on their summer break, pedalling through southern Africa. They plan to camp out a lot and will meet other friends along the way in Maputo. I was keen to join them untill I felt the weight of their bikes! Loaded down with racks and panniers for all their gear and even with these heavy loads (20kg) they are aiming to ride about 50-70km per day. I really admire their sense of adventure and eagerness to explore. We swopped email adresses so will hopefully be able to stay in touch - all the best for your adventure guys, I know you'll have a really great time! I had 2 spanjards staying with me once that cycled from spain through asia and africa's east coast. They were going to Cape Town and then back up to spain via the west coast. There bikes weighed closer to 40kgs each, and with that load they ride simple shimano deore/acera 8x3 speed and rigid frames, 5bar preasure, but they prefer to stay on tar. Something completely different, but the tar freaks me out. Now that you've dined so well at the singlespeed banquet.........;) Please pass on my details to any cycle travellers who may be headed this way, they're always welcome.